Have you ever wondered which is more hygienic, Hand Dryers or Towels? How many times have you wondered about which hand drying method is most hygienic? Well, a recent American Study 1(2018) looked at the impact of hot-air hand dryers on the spread of bacteria, and you have your answer. Hand dryers can increase the amount of bacteria coming in contact with your hands by between 18 and 60 times!, compared to the normal levels of bacteria in the air of a bathroom. Retrofitting hand dryers with HEPA2 filters can reduce bacterial deposition by 4-fold, when measured after 9 days. However, while HEPA filters in hand dryers most likely reduce the number of potentially pathogenic bacteria, they need regular maintenance and do not eliminate the risk entirely. The possibility that the bacteria may come from a reservoir inside of each dryer was also tested, and the results indicated that it was “extremely unlikely”. Several results from this study strongly indicate that bacteria dispersed by hand dyers are from general bathroom air passing through the hand dryer, not from a bacterial soup, as it were, stored in the dryers themselves. An earlier UK study3(2014), using 60 tests and 60 controls, found similar results—with bacterial counts for jet air dryers being 4.5 times higher than the warm air dryer, and 27 times higher than the use of paper towels, reinforcing the benefits of paper towels. Separate tests used hands coated in paint to visualize droplet dispersal. These visualization experiments demonstrated that the jet air dryer caused the most droplet dispersal. 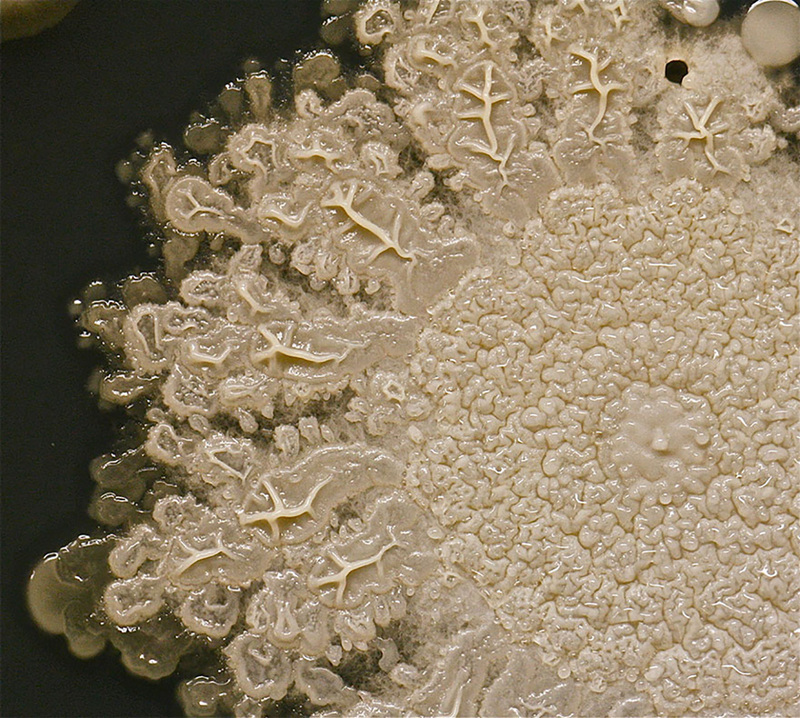 In three distinct departments of a US academic health center (we are unclear what that means exactly), hot-air hand dryers were screened for their deposition of bacteria on Agar plates.4 This beautifully designed experiment sought to measure levels of bacteria deposited on peoples hands, and then tested a variety of possible sources. Plates that were exposed to hand dryer air for 30 seconds averaged 18 to 60 colonies/plate; however plates exposed to bathroom air for 2 min, with hand dryers off, averaged 1 colony. In addition, plates exposed to bathroom air, that was moved by a small fan for 20 min, had averages of 15 and 12 colonies per plate. This result suggested a correlation between air movement and the proliferation of bacteria. Overall results include the following observations: (i) very low numbers of bacteria were found on hand dryers’ internal nozzle surface; (ii) there was an 4-fold reduction in bacteria deposited by air from hand dryers retrofitted with HEPA filters; and (iii) when corrected for airflow and exposure time, there were similar levels of bacterial deposition from bathroom air moved by small fans and hand dryers. 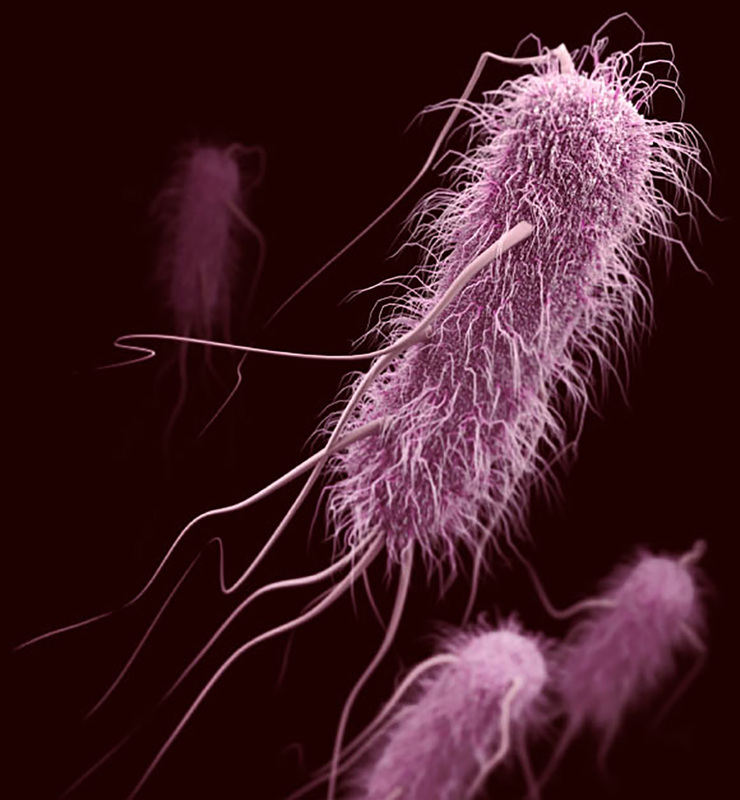 This last part supports the thesis that it is the concentration of air that causes the increase in bacterial numbers. (i) Covering all angles, the researchers explored the possibility that the the hand dryers themselves were the primary source of bacteria. To test this possibility, the inner surface of hand dryer nozzles from eight different bathrooms, four with and four without HEPA filters, were swabbed. An average of only 4 colonies was recovered per bathroom. Thus, the researchers argue, it is extremely unlikely that hand dryers carry within the nozzle a significant reservoir of bacteria. Almost all of the bacteria deposited on plates by the hand dryer air is coming from the bathroom air—either passing through hand dryers, without HEPA filters, or by being pulled into the air coming out of hand dryer nozzles by convection. (ii) While HEPA filters reduced the numbers of bacteria deposited on the agar plates, potential pathogens were still recovered. Thus, HEPA filters in hand dryers most likely reduce the number of potentially pathogenic bacteria, with the potential to colonize hands, but do not eliminate the risk entirely. In a ‘loosely’ connected story,5 we have Tasha Sturm, a lab technician at Cabrillo College in California. One day Tasha decided to include her 8-year-old-son in a harmless experiment. 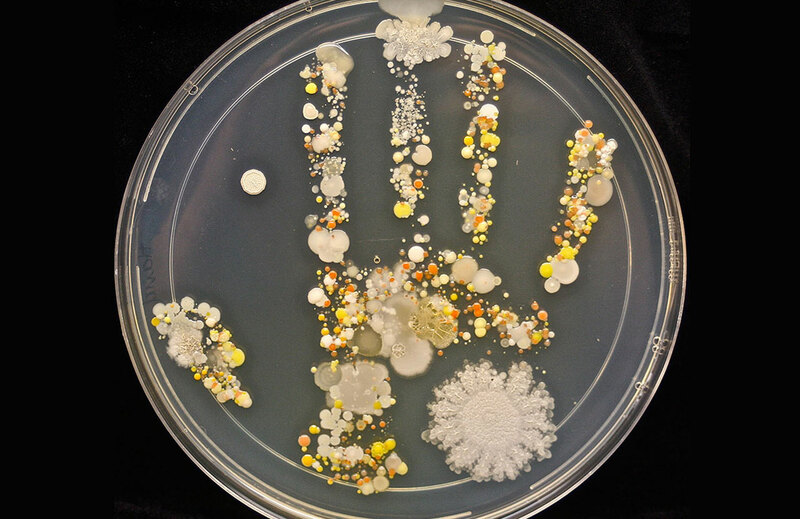 She used a petri dish to gather bacteria, yeast and fungi that were found on his hand, after he finished playing outside. The colourful colony that emerged, represents the harmless microbiome that we occupy every day. 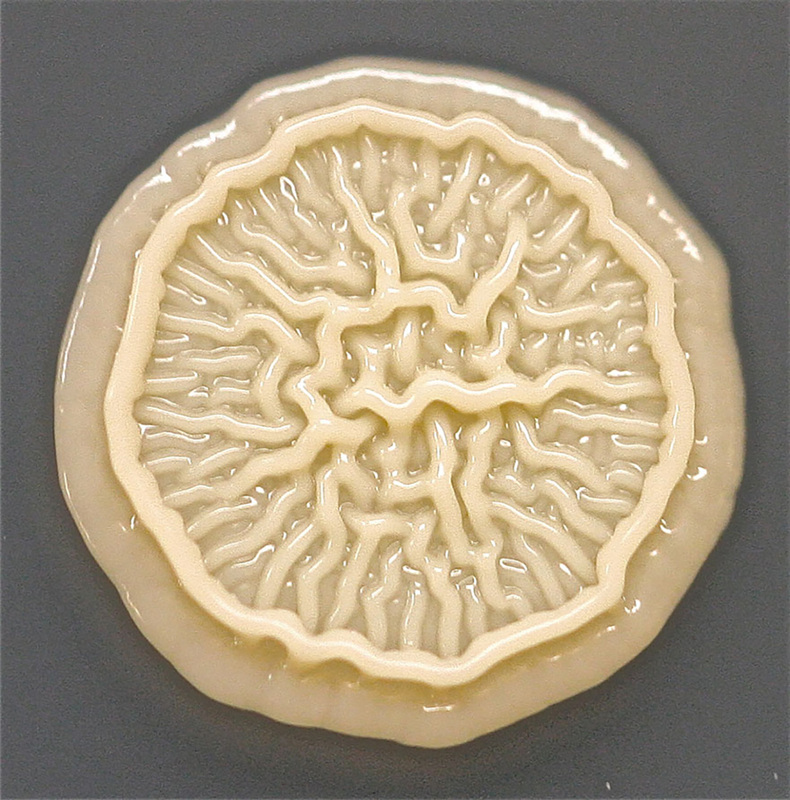 “That one colony probably equals several million bacteria,” Sturm told Business Insider, “but you’re probably not going to see a colony like this blooming on your hand any time soon. When we do something like this we’re giving the bacteria absolute optimal conditions to thrive and be happy,” Sturm said. Unlike the relatively benign hitchhikers on Tasha’s son’s hands, the spread of bacteria found in healthcare environments is cause for significant concern. The results of the previous experiments suggest that air dryers may be unsuitable for use in healthcare settings, as they may facilitate microbial cross-contamination, particularly anti-biotic resistant strains, to the environment or to bathroom visitors.